A daughter, Anne, was born to Edward Hyde and Frances Aylesbury at Cranbourne Lodge Windsor. She was named after her father’s first wife. Anne’s father was elected Member of Parliament for Shaftesbury and Wootton Bassett and sat in the Short Parliament. Anne’s father was elected Member of Parliament for Saltash and sat in the Long Parliament. Although he was critical of some of the actions of King Charles I he believed in the monarchy. King Charles I raised his standard at Nottingham effectively declaring war against Parliament and beginning the English Civil War. Anne’s father was a Royalist and opposed to those in Parliament that wanted war against the King. Anne’s father went to York where he joined King Charles I.
Anne’s father was knighted and made a member of the Privy Council. Anne’s father became Chancellor of the Exchequer. With the Civil War won by Parliament, Anne’s father fled England with prince Charles. King Charles I was executed by beheading, in front of the Banqueting House at Whitehall Palace, London. He was buried in St George’s Chapel, Windsor. Anne and her family were shocked by the execution. The Scottish parliament proclaimed prince Charles, King Charles II of Scotland. Parliament declared England to be a republic. Anne and her family were shocked by the execution of the King and fled to the Netherlands and the court of Mary, daughter of Charles I, who was married to William II of Orange. Mary made Anne a maid of honour. Anne met James, Duke of York when Mary of Orange was visiting Paris. James Duke of York promised Anne that they would get married. In England, Richard Cromwell was removed from power by the army who reinstalled the Rump Parliament (the parliament that had tried King Charles I for treason). Charles, was proclaimed King Charles II by parliament. James Duke of York was created Lord High Admiral and Warden of the Cinque Ports. Anne, who was heavily pregnant, married James Duke of York in a private ceremony in London. A son, Charles, was born to James and Anne Hyde at Worcester House, London. He was styled Duke of Cambridge. Anne’s father, Edward Hyde, was created Baron Hyde. James was created Duke of Albany in Scotland. Anne’s father, Edward Hyde, was created Earl of Clarendon. Anne’s son, Charles, died at Whitehall Palace. A daughter, Mary, was born to Anne and James Duke of York at St James’s Palace, London. King Charles II married Catherine of Braganza who was a Catholic in a public Anglican ceremony. A son, James, was born to Anne and James Duke of York at Worcester House, London. A daughter, Anne was born to Anne and James Duke of York at St James’s Palace, London. It was considered safe to return to London and Charles, Catherine and the court returned to the city. A son, Charles, was born to Anne and James Duke of York at St James’s Palace. A fire broke out at a bakers in Pudding Lane. It destroyed more than 13,000 houses and 87 churches including St Paul’s Cathedral. James was put in charge of the firefighting operation. Anne’s son, James, was made a Knight of the Garter. Anne’s son, Charles died at St James’s Palace. Anne’s son, James died at Richmond Palace. Anne’s father was charged with treason and fled to France. A son, Edgar, was born to Anne and James Duke of York at St James’s Palace, London. The birth left Anne weak and ill for more than a year. James converted to Catholicism. His conversion was kept secret and James continued to attend the Anglican church. At Charles’s order his two daughters, Mary and Anne were raised as Protestants. A daughter, Henrietta, was born to Anne and James Duke of York at St James’s Palace, London. Anne’s daughter, Henrietta, died at St James’s Palace. A daughter, Katherine, was born to Anne and James Duke of York at St James’s Palace, London. 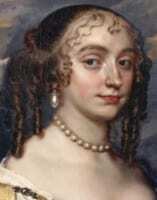 Anne Hyde, died at St James’s Palace, London from breast cancer.